Autonomous systems will play an essential role in many applications across diverse domains including space, marine, air, field, road, and service robotics. They will assist us in our daily routines and perform dangerous, dirty and dull tasks. However, enabling robotic systems to perform autonomously in complex, real-world scenarios over extended time periods (i.e. weeks, months, or years) poses many challenges. Some of these have been investigated by sub-disciplines of Artificial Intelligence (AI) including navigation & mapping, perception, knowledge representation & reasoning, planning, interaction, and learning. The different sub-disciplines have developed techniques that, when re-integrated within an autonomous system, can enable robots to operate effectively in complex, long-term scenarios. 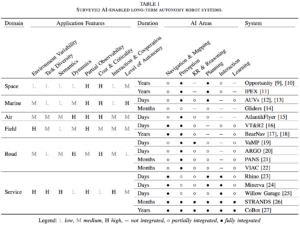 In this paper, we survey and discuss AI techniques as ‘enablers’ for long-term robot autonomy, current progress in integrating these techniques within long-running robotic systems, and the future challenges and opportunities for AI in long-term autonomy.